The glint of colourful foil has been catching the eyes of supermarket shoppers since just after Christmas. Despite having months to prepare, last-minute egg hunting is an Easter ritual, whether one is searching for a last-minute gift or something that sparks joy in little chocolate lovers. We've rounded up Easter eggs for every budget and body, from luxe to vegan to the downright absurd. Although there are countless artisan chocolatiers around the country painstakingly crafting the kinds of eggs you feel guilty destroying, we've limited this list to those that are a little more accessible – that means they're either available at multiple outlets, online or can be shipped nationwide. Let's see if we can get through 2019's Easter egg list without a single egg pun. Try to crack this football-sized, 230-millimetre-thick egg on your forehead and you might end up in hospital with concussion instead of on the couch with a tummy ache this year. Still, it's softer than Haigh's regular chocolate thanks to the addition of extra cacao butter, which helps pop the eggs from their tortoise-shell patterned moulds, and makes the chocolate especially smooth and creamy. These oversized eggs are available in milk and dark chocolate, but have to be picked up in store – not a bad thing when the shop policy is to drown customers in samples. David Jones handmade ruby egg, $29.95. In 2017 Swiss chocolate manufacturer Barry Callebaut revealed what has been called the most exciting chocolate discovery in 80 years: ruby chocolate. While milk and dark chocolate lovers might not agree, white chocolate fans will. This isn't coloured white chocolate; the pink hue comes from the ruby cocoa bean. It has a similar, sugary sweetness to white chocolate but with fragrant berry notes and a hint of tang. 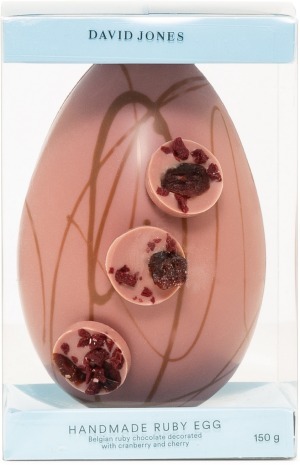 David Jones is selling a ruby chocolate egg wearing three ruby chocolate buttons, each decorated with dried cranberry and cherry bits that enhance the fruit-driven flavours. Old MacDonald might have had a farm, but he had nothing on this adorable collection from Victorian-based chocolatier Cacao. Each comes in a set of three. Choose between white chocolate chickens hand-sprayed vibrant yellow and orange, shiny black-and-white piebald milk chocolate cows or naturally floral and fruity ruby chocolate piggies. 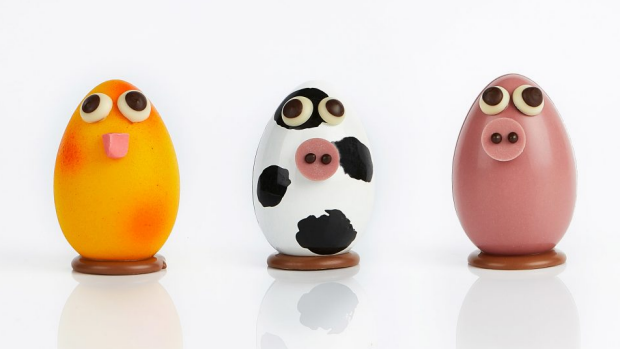 Made with silky Belgian chocolate, these farm animal eggs are as artfully crafted as they are adorable. Hopefully next year Cacao offers mixed sets with one of each animal. Until then, one of each ought to do the trick. Koko Black has mastered the art of accessible gourmet chocolate. Quality is always outstanding thanks to Aussie ingredients combined with Belgian couverture chocolate, and its Easter eggs are no exception. 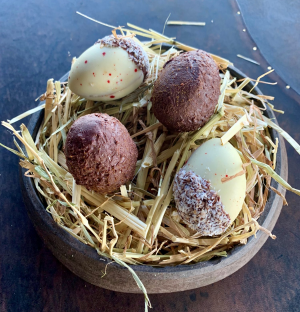 The company's Inbetween Eggs are textural sensations, with more adult flavours such as salty cashew crunch and the new golden egg made from orange, pistachio and caramelised white chocolate. 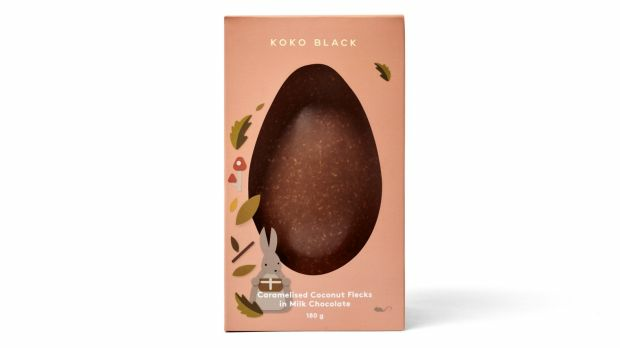 Our pick is the egg with caramelised coconut flecks, which give the chocolate – either milk or 54 per cent dark – a subtle crunch reminiscent of a nostalgic coconut rough. Buy two for $40. We've all heard of Cadbury Creme Eggs, the intensely sweet, gooey Easter treat with a cult-like following. 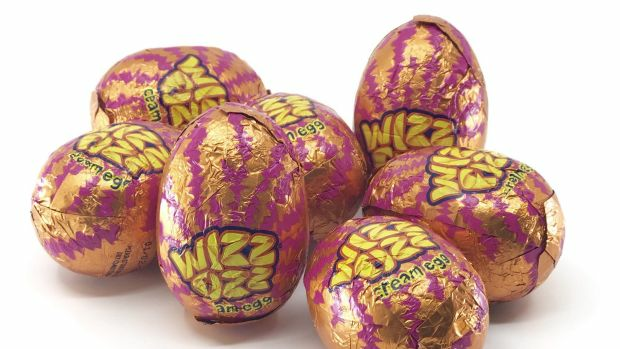 This year some stiff competition has appeared in supermarkets in the form of the Wizz Fizz Cream Egg. It has a dense sherbet filling that's more paste than cream, speckled with popping candy. Is it delicious? Do the flavours marry as well as Meghan Markle? These questions are irrelevant – it's an experience you need to have, even if it's only once. 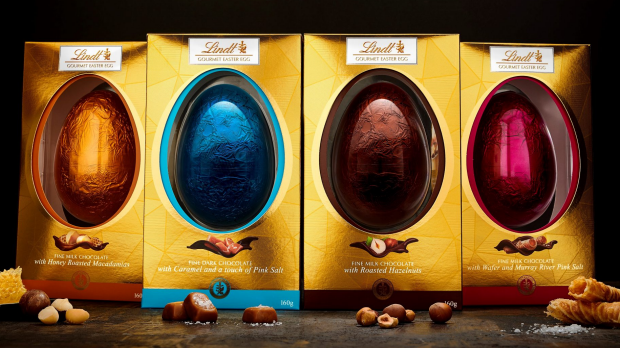 Lindt's range of Gourmet Easter Eggs. Put down that golden bunny! Lindt has a new Easter chocolate range. There's a dark chocolate egg (with caramel and pink salt) and three milk chocolate eggs (wafer and Murray River pink salt, honey-roasted macadamias and roasted hazelnuts). It's a close call between the honey-roasted macadamia egg that's smooth on the outside with a knobbly, nutty interior, and the wafer and pink salt egg, whose ingredients subtly change the texture and flavour and make it difficult to stop at just a nibble. Only Mine, in Melbourne's Dandenong Ranges, ships its chocolates nationwide. 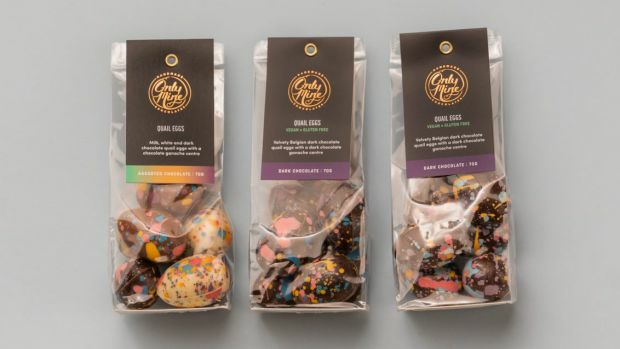 Its take on speckled quail eggs – which come seven to a pack – are rich mouthfuls of Belgian dark chocolate with pastel paint speckles on the outside and velvety ganache in the middle. Did we mention they are also vegan, dairy-free and gluten-free and taste just like the real thing (chocolate, that is, not quail eggs)? 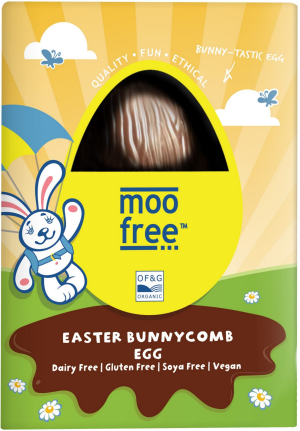 Available from The Chocolate Box and also at some health stores and supermarkets, this dairy-, gluten- and soy-free Easter egg is far superior to the newer sea salt and caramel version from the same family-owned manufacturer. Although connoisseurs will instantly notice the difference when compared with real chocolate, the vegan "bunnycomb" (made with toffee, not honey pinched from beehives) disguises the slightly plasticky flavour and adds brittleness to each bite. Better yet, it's certified organic. 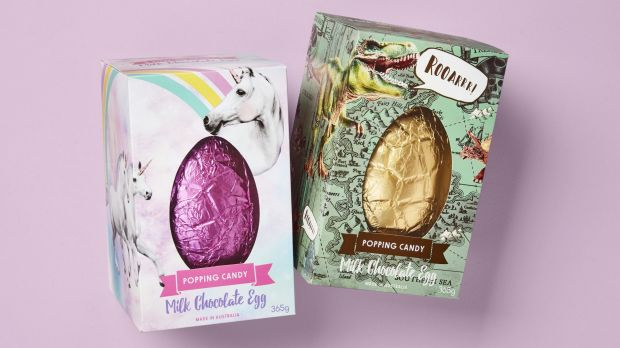 Kmart's popping candy unicorn (left) and dinosaur eggs. What's better than a football-sized milk chocolate egg peppered with popping candy and wrapped in gold foil? One that comes in either pretty pink unicorn and rainbow packaging or a green box printed with dinosaurs and a treasure map with a skull and crossbones pirate – depending on your child's inclination. The designers have pulled out every gender cliche in the book for packaging, but they're cliches for a reason. As for the egg, it's 365 grams of perfectly fine milk chocolate with added excitement from the popping, cracking and whizzing on the tongue. 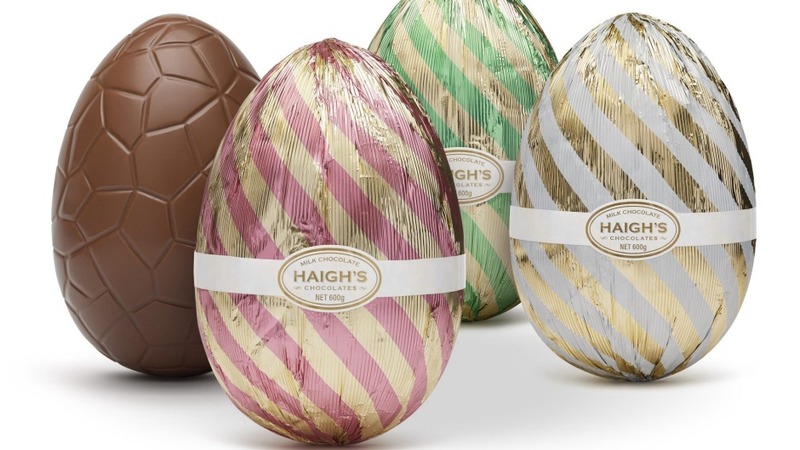 Coming in at more than $16 for a five-centimetre by three-centimetre egg, this pack of six is the ultimate luxe option. There are only 50 made-to-order boxes available and each contains two types of Valrhona chocolate egg: caramel macadamia, a textured, dark chocolate shell that oozes with salted caramel and crushed macadamia praline, and the lamington egg, a red-speckled, white chocolate shell that's been dipped in milk chocolate and desiccated coconut after being filled with milk chocolate ganache swirled with house raspberry jam. Keep out of reach of children. Kiwis have dubbed 2019 "Breggsit" as this Easter marks the first in 89 years that they can't buy Cadbury eggs made in New Zealand. 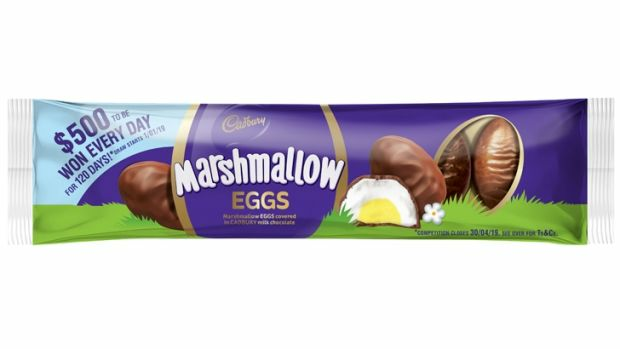 Cadbury closed its last factory across the ditch last year, moving production of its much-loved marshmallow eggs to Australia. But Aussie equipment can't replicate the old shape, and Kiwis are furious that this year's run is only half an egg instead of the original two halves joined by a layer of chocolate, which people enjoyed pulling apart. How about placing two of the six eggs together and taking a big, fluffy, sweet marshmallow bite, eh bro?